I probably watch Dr Who for the reason most people my age do – nostalgia. Bizarrely, Dr Who is one of my first memories of coming to the UK. I still viscerally remember (I WAS six) watching Patrick Troughton combatting the Cybermen and the Yetis – it somewhat set the tone for my impression of Britain *wide grin*. However, mostly, I find the experience less than inspiring. Gaiman’s episode is a rare exception. What I most like is the way that he picks up on several key aspects of Dr Who that I have always found the most interesting. One is the Tardis itself. I’ve never understood why it is treated like a flying livingroom with the sole point of interest being what lies outside its front door, oh and the oft repeated – and, admittedly, the still amusing wonder of some poor schmuck who stumbles into the Tardis and discovers it to be “bigger on the inside than the outside”. It has always struck me that the Tardis is of supreme fascination and, potentially, a world unto itself. Earlier episodes have explored this – going way back, I seem to remember the Tardis having a medieval belfry – so it’s not as if Gaiman has invented this, but boy did he run with it. 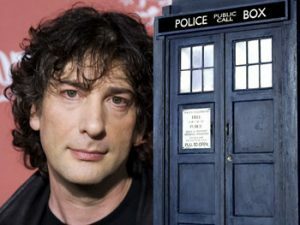 The notion that the reason we’ve seen so many control rooms is because they’re effectively ‘software constructs’ tickled me with delight – and Gaiman riffed on this theme – with the Dr himself commenting that, sure, he’d changed the “desktop”, and the Tardis, in human form, declaring that she’d “archived” not only the versions of the control rooms the Dr knew about, but some that hadn’t yet come into being, at least from his point of view – a nice temporal play (and one among many). There is a lot more like this. Jettisoning rooms to increase speed, for example, continues the metaphor of Tardis as computable space. Once this central metaphor is declared, I don’t imagine it’s going to be easy to dispense with it. This exploration of the possibilities of such a conceit is what I feel all speculative writers should be about – stretching the limits of their inventions. Finally, I can’t finish without mentioning the exhilarating chase in the tardis the Dr cobbles together from parts. Boffin as rough riding hero. That crazy careering flight with only a raw forcefield as an outer skin – what an utter delight! So, Neil Gaiman has proved, to me at least, why his work is so well considered – and I thank him for entirely blowing me away with one of the few episodes of Dr Who that has wowed me since I was six years old. Wonderful web site. Lots of useful information here. I am sending it to a few buddies ans additionally sharing in delicious. And naturally, thank you in your effort! I like the helpful information you supply to your articles. I’ll bookmark your weblog and take a look at once more here regularly. I’m reasonably certain I will learn lots of new stuff proper here! Good luck for the next! Nice idea of bloog.I’m from Italy I read many fromulars about it.Kind regards from Ireland. Ricardo, for which reasons do you find DW in general ‘less than inspiring’? (Agree with you on The Doctor’s Wife, btw.). Just curious. It’s definitely my favourite episode of the series so far, and will quite definitely feature highly in any future lists of ‘best Doctor Who episodes of all time’ — utterly Gaiman but also utterly Doctor Who. At the risk of revealing myself to be an utter Doctor Who Fanboy, I should point out that the idea of the Tardis interior being “computable space”, as you put it, actually goes back to Tom Baker’s final story in 1981. Steven Moffat himself, in the 10th Doctor meets the 5th special for Children in Need, had some fun with the ‘desktop theme’ idea, suggesting that, in addition to the “coral” of the 9th/10th Doctors, there’s also a “leopard skin” option we haven’t seen yet! A mini-documentary about the Tardis on the Masque of Mandragora DVD (the hook being that the story introduced a Jules Verne-styled ‘secondary’ control room) highlighted the two main approaches to the Doctor’s time machine. On the one hand you had former script writer/editor Christopher H Bidmead, who clearly is still fascinated by the idea of the Tardis and would be happy to set an entire story — an entire season, even — inside the Doctor’s time machine. On the other you had Robert Shearman (writer of 2005 episode ‘Dalek’) who believes that, when you’re heading to Narnia, you really shouldn’t spend too much time focusing about the wardrobe. Must admit, I prefer the full scale and content of the Tardis to be hinted at, to be at best glimpsed, rather than shown in too much detail (though corridors are always good, and the new ones are simply fabulous). what’s the name of the episode so i can hook it from the cloud…?